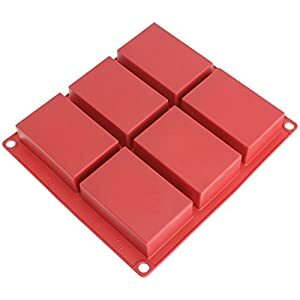  CONVENIENT FOR MANY DESSERTS – BONUS SPECIAL eBOOK: This Magic Cake Mold is suitable for making the cake, pizza bread, mousse, jelly, conditioning food, chocolate, pudding, fruit pie and so on. Such an Amazing Gift for Bakers! Especially easier with the DELICIOUS DESSERT eBOOK attached. PLEASE NOTICE: “Drhob(TM)” is FAKE seller. We don’t respond any question when you buy the product from this seller, please careful, thank you so much! 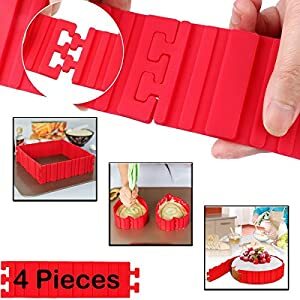  NON STICK HIGH QUALITY MATERIAL: 4 PCS Bake Snake Moulds were made of high quality silicone material. Cake Decorating Set include 6 stainless steel tips and a reusable silicone pastry bag. Can be easy to clean and dishwasher safe. 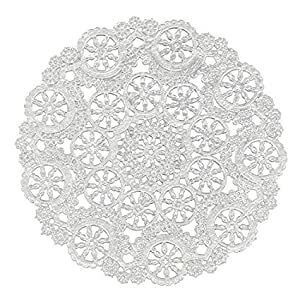  CREATE ANY SHAPE AND CLEAN EASY: You can DIY all kinds of shape you like such as heart cakes, round cakes, square cakes, diamond cakes and MORE! Extremely Simple with this cake pan mould set, simply connect the bake snake together to create your desired shape. Then remove the cake mould quickly, not easily deformed. THICKER WEAVE: Our burlap roll is the one and only with a weave of 50 yarns per every 10 centimeters. This creates a tighter, no-gap weave for a more durable material and a sophisticated look at your event. 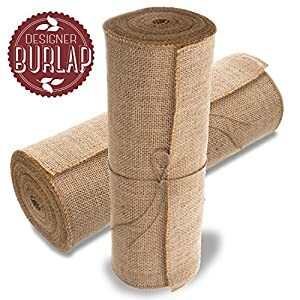 Forget rougher, coarser burlap rolls. This roll of burlap has rows of neat, symmetrical stitching. Result: It’s softer, smoother, suppler & easier to work with. SEWN EDGES TO STOP FRAYING: No more raw, frazzled edges. Side edges are sewn and overlocked so your rolls of burlap and burlap table runners won’t unravel or fall apart. This roll of burlap fabric is a seamless ten yards, not smaller pieces sewn together. Whether you use the whole 14 INCH WIDE by 10 yard roll at one time, or trim it into sections, the results will be beautiful – with a cleaner, classier look. ENDLESS POSSIBILITES: Whether this burlap is impressing guests at your special event or adding that unique rustic look to your home décor, or even being used for gardening and landscaping, you’ll be coming back for more! ★ Material: Imitation Pearl, Wonderful gift for youself girlfriend and mom. ★ Handmade items,One size fits all. 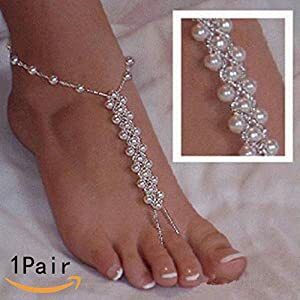 be worn barefoot or with shoes. ★ Stunning triple Pearl Design. Hand Made Ankle to Toe Anklet. Popular temporary tattoos; Each sheet measures 3.9 inch by 7.8 inches. Color: mainly golden. Material: durable hard alloy. Chain length: about 81cm plus an approx. 10cm extension. Adjustable belly chain design, making it suitable for most women to wear. NATURAL PROTECTION – Black Tourmaline has been known throughout the ages as the most potent protective charm in existence. Wearing it guards yourself from physic attack, negative energy, EMF and radiation while easing anxiety and increasing self confidence. This gemstone works with the Base Chakra and is a Libra Birthstone. RAW AND NATURAL CRYSTAL FOR STRONGER EFFECT – we use only authentic, genuine and unique minerals for their powerful spiritual healing energies. 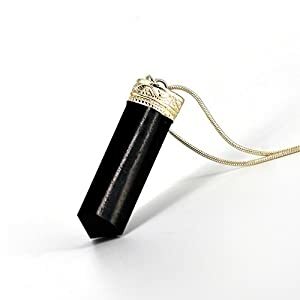 As well as wearing the necklace as jewelry the stone is of sufficient vibrations to be used for Wiccan rituals and reiki/pranic healing modalities. QUALITY 18″ SILVER PLATED NECKLACE FOR EXTRA COMFORT – easy to put on/take off with lasting quality lobster-claw-clasp. 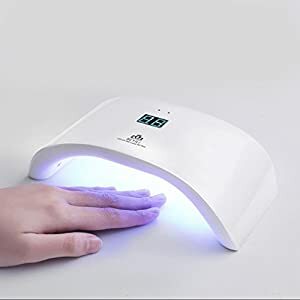 【ALL-IN-ONE BEST QUALITY SUPERIOR NAIL DRYER】With new professional designed UV+LED dual light source,this nail dryer is applicable to curing almost all nail gels! Its light is closer to white light, has no harm to eyes and skin. Fashionable and durable 50000hrs lifetime. 【PROFESSIONAL AND CURING ALMOST ALL NAIL GELS】LED gels, UV gels, including Hard Gels, buildings, sculpture gel, gem glue etc.. Easy to use, just plug in and you are ready to go! 【FAST AND COMFORTABLE】It is 36w low wattage but quick-drying which can shorten your curing time by 50% or overheat than others dryers. Fast, very energy efficient and durable constructionQuick and quiet, NO NEED ANY FANS!